Still in Need of Comfort Food? Roast a Chicken. With a chill still in the air, I was in the mood for comfort food last night. Thus, the inspiration for roasted chicken with potatoes and carrots. For this recipe, I use a roasting chicken of about 5 pounds. Remove the giblets and stuff with half a lemon and several sprigs of fresh thyme. Slice Yukon Gold potatoes (I use three medium ones for two people) and peel and slice a small bunch of carrots. Drizzle the chicken and vegetables with the juice of the other half of the lemon and extra virgin olive oil. Season with sea salt and fresh ground pepper as well as additional sprigs of thyme. 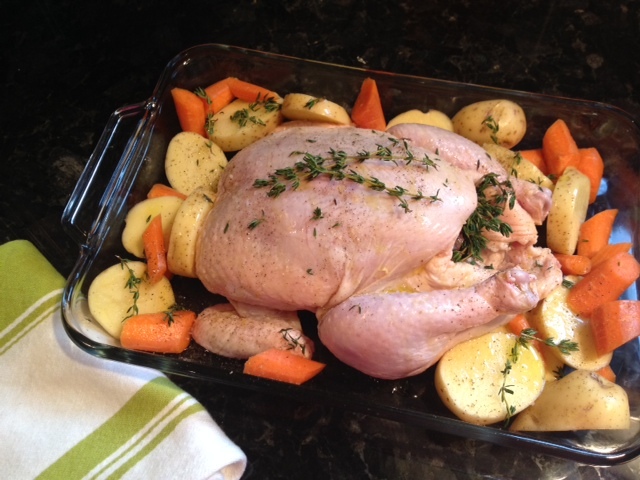 Roast in an oven preheated to 425 degrees for about 1½ hours. While the chicken is roasting, use a large spoon to move around the vegetables so that they become coated with the pan juices, and spoon the juices onto the chicken. Determine whether the chicken is cooked by cutting between the thigh and breast to see if the liquid runs clear. My husband and I typically eat the thighs and legs and a small amount of white meat for dinner, leaving most of the white meat for lunches. To use the remaining chicken for a salad, pick the meat from the bones and pull it apart into chunks. Squeeze some balsamic glaze on the chicken and season with salt and pepper. Also, mix in some pecans for a little crunch. Store in the refrigerator until ready to toss with some arugula for a light lunch. 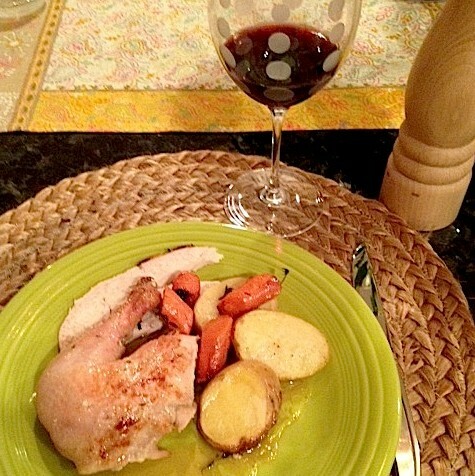 Enjoy your roasted chicken for dinner and beyond! This entry was posted in Uncategorized and tagged Carrots, Chicken, Cooking, Food, Lemon, Potatoes, Recipe, Roast, Thyme. Bookmark the permalink.